37-year-old Veeramani Sekar from Chennai, who works in a bank as a manager is hearing-impaired since birth. A few years ago he started learning the art of mime (performance without speaking by using body movements and facial expressions) to communicate better. Back then little did he know that he would end up using this art form to spread awareness about road safety. It was on an unfortunate day in 2014, when Mr Sekar met with an accident while travelling with his daughter on his bike. Though, both escaped any significant injuries but the incident left a deep impact on him. He realised that on roads a split second is all the difference between life and death and the only option is to take precautions, to not just prevent accidents but also curtail fatalities. He made spreading awareness about road safety the mission of his life. Since then, Mr Sekar has been using mime to sensitise people on the importance of obeying traffic rules like wearing helmets and seat belts, sticking to speed limits and avoid speeding, driving without distractions (mobile phones or eatables) and acknowledging the rights of pedestrians. After this shocking accident, he joined Thozhan, an organisation which is actively working for the past 10 years across Chennai to spread awareness on road safety, under their initiative, ‘Accident Free Nation’. He gave the idea of using mime to reach out to people, to Thozhan founder M Radhakrishnan, who instantly agreed. So far, Mr Sekar has given a number of performances at traffic signals in Chennai. 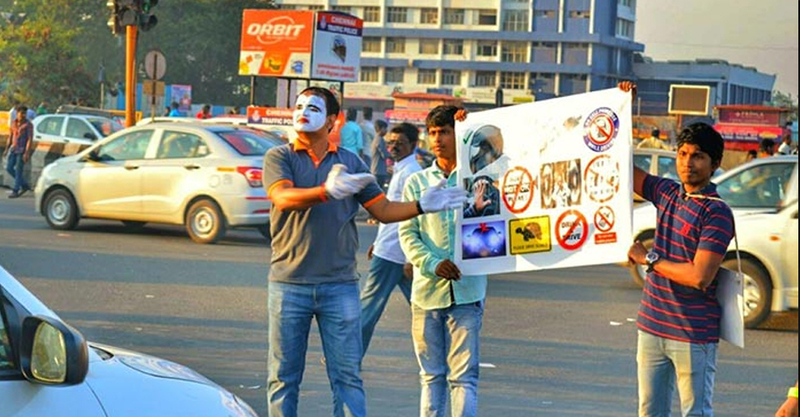 In the available time (60-90 seconds) that he gets to perform at the traffic signal, he mimes out a short tale to educate motorists to adopt road safety measures, while other volunteers of Thozhan distribute pamphlets with road safety messages like ‘follow lane discipline’, ‘don’t drink and drive’ and ‘do not jump red lights’. The volunteers also do one on one conversation with motorists to wear seat belt and helmet. “Action speaks louder than words. When we speak, people tend to ignore us. But when we approach them wearing bright make-up, colorful dresses and use mime language as tool to communicate, they get curious about what are we doing. Then I make use of this attention to enact a message on road safety”, explains Mr Sekar. Talking about how effective is mime language as a communication tool to educate people on road safety Mr Sekar said that people easily understand the concept rather than a long speech or literature. The mime act at traffic signals is in line with Thozhan’s thought process to engage with people rather than preach. 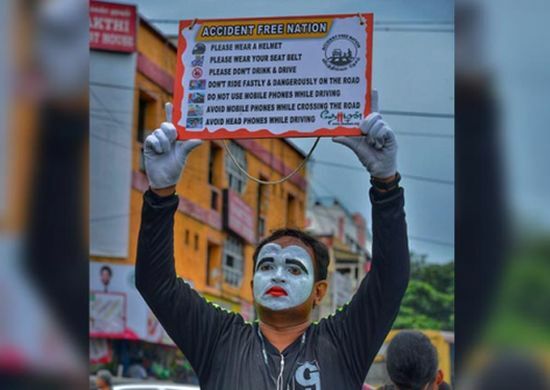 As part of their ‘Accident Free Nation’ initiative, over 3,000 volunteers take to signals, parks and other places in the city, with sign-boards and other paraphernalia. In terms of support from the authorities, Mr Sekar states that the traffic police officials help with necessary permissions for the mime performance at traffic signals. Apart from traffic signals, Mr Sekar also performs at schools, colleges and corporate houses, as part of Thozhan’s road safety awareness campaigns. He also works towards training a team of members to use mime language for road safety awareness in the country, where a total of 4,80,652 road accidents took place in 2016 resulting in the loss of 1,50,785 lives and inflicting serious injuries on about 4,94,624 persons. 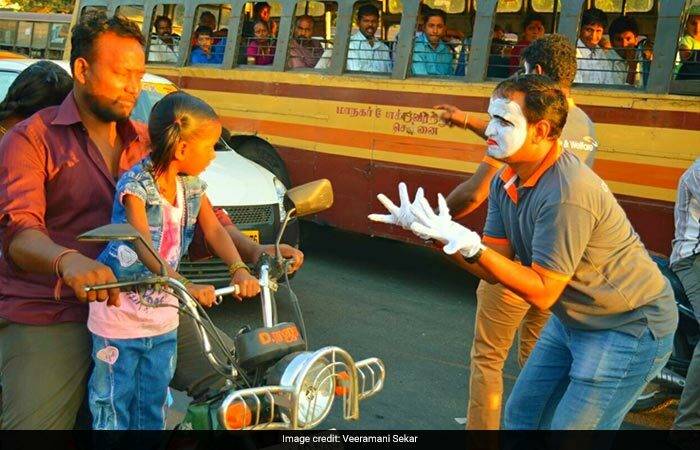 Through mime acts, Mr Sekar has been adding considerable value to road safety campaigns being conducted by Thozhan across the busy traffic signals in Chennai.